Vice Chairman of the National Assembly Uong Chu Luu commenced his working visit to Japan from July 3. At Japan’s National Graduate Institute for Policy Studies (GRIPS) in Tokyo, the NA Vice Chairman had talks with GRIPS President Akihiko Tanaka, and Director of the Centre for Global Leaders Development to learn from Japanese experience in public management and reform of the Japanese Government. He spoke highly of the Institute and its President Akihiko Tanaka, who was responsible for directing a large number of significant projects in Vietnam in his role as the President of the Japan International Cooperation Agency (JICA) from 2012-2015. 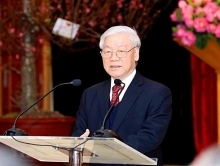 Luu expressed his hope that as the President of the Institute, Akihiko Tanaka will promote the strategic partnership between Vietnam and Japan in a more effective manner over the coming time. 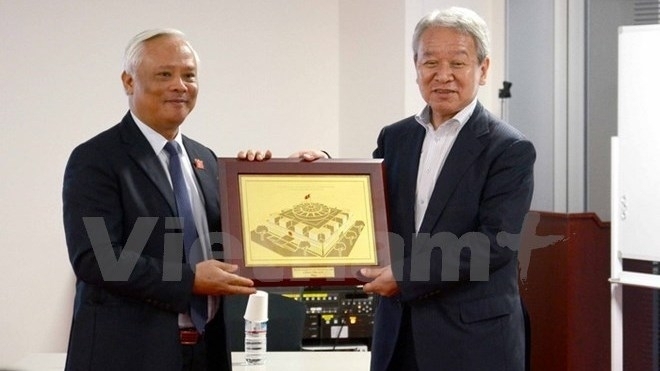 For this part, Akihiko Tanaka pledged to boost cooperation between his institute and Vietnam’s relevant agencies, particularly in personnel training. The same day, Vice Chairman Luu visited the Embassy of Vietnam in Japan, praising the embassy’s contributions to the development of Vietnam-Japan ties. Vietnamese Ambassador Nguyen Quoc Cuong highlighted the growing relationship between the two nations, with the increasing number of high-level and local delegation exchanges. Representatives from 30 provinces and cities in Vietnam travelled to Japan to promote trade, investment and cultural exchanges in 2016. In addition, the number of overseas Vietnamese accounts for seven percent of the total foreigners in Japan, including 60,000 students, almost tripling the total number of students from other Southeast Asian nations, he said. The figures indicate that the Vietnam-Japan relations will develop further, the ambassador added. The NA Vice Chairman also took a tour of Canon Group, one of the most successful investors in Vietnam. The group said it is keen to invest further in the support industry in Vietnam.